The house has three main bedrooms: One Queen-sized bedroom, one double bedroom and one twin bedroom. There is also an additional small room with a set of bunk beds. The main bathroom has a spa-bath where you can relax and gaze out across the valley. If there are just 2 of you, you can close off one half of the house and enjoy the spacious kitchen, lounge and dining room and a bedroom with ensuite. Lavender Farm offers all the comforts of home enhanced by numerous extra touches, such as the fresh flowers, homemade cake and chocolates awaiting you on arrival. The house also provides free wifi, flat screen TV, ipod docking and a dvd player. When you arrive you’ll find the kitchen stocked with full breakfast provisions including organic granola, local bacon and free-range eggs, local jam and Giant Steps bread and good coffee and teas. On crisp winter nights you can relax on leather sofas in front of the wood-fired heater in the spacious lounge room. There is also reverse cycle heating and cooling in all the bedrooms and living area and electric blankets on the beds so you can remain cosy or cool. The grounds of Lavender Farm are a delight: Depending on the time of year you can enjoy the spring bulbs and orchard blossoms, flowering native plants, roses, or autumn colours. Guests are welcome to help themselves to herbs growing in the garden and pick their own lemons from our lemon orchard. 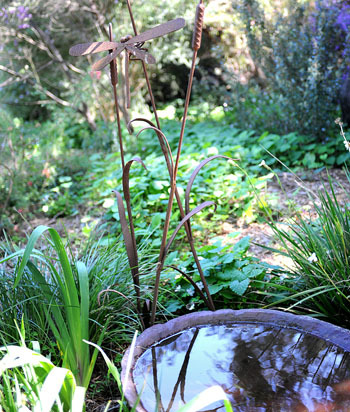 The property also has a wide array of fruit trees, potager and vegetable gardens. There are many spots to enjoy a picnic or curl up with a good book. You can take a wander down to the large dam and spot many varieties of water birds and possibly even a very large domesticated duck that we have tricked into believing he is a wild duck! Guests are welcome to enjoy our family pool by arrangement. Generally the pool is available for use Monday to Saturday between 10-4pm. 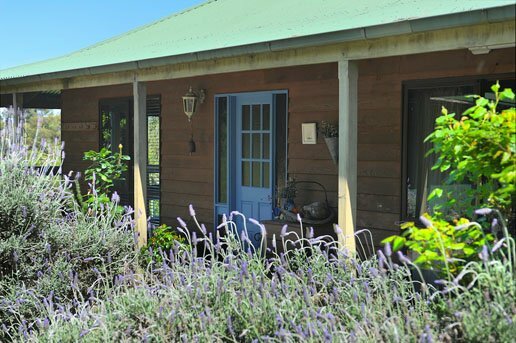 Lavender farm is an ideal base from which to explore the Yarra Valley. Within a 5 minute drive from your accommodation you have dozens of wineries, Tarrawara Museum of modern Art, the Healesville Sanctuary, and fine dining and café options such as the Healesville Hotel, Bella Vedere and Giant Steps. It’s also a short drive to a range of function venues such as Stones, Oakridge and Rochfords. For guests holidaying in the Yarra Valley we are happy to help assist with your planning and point you in the direction of some of the Yarra Valley’s hidden treasures.